Growing up in the 90’s, I can remember seeing adverts for a very unique toy, Stretch Armstrong, he was a super hero who in the adverts would stop crime by using his powers to stretch, bit like Mr Fantastic from The Fantastic Four, only he later got a Dog and then a dedicated villain. He’s still around too, go into ant decent toy shop and you can probably find both him and his dog. In recent years, the Stretch Armstrong brand has branched out, you can now get a stretchy Batman, Scooby Doo and even George Lizzy and Ralph from the original Rampage video game. So imagine my surprise when out of nowhere a Sonic Stretch Armstrong suddenly pops up. 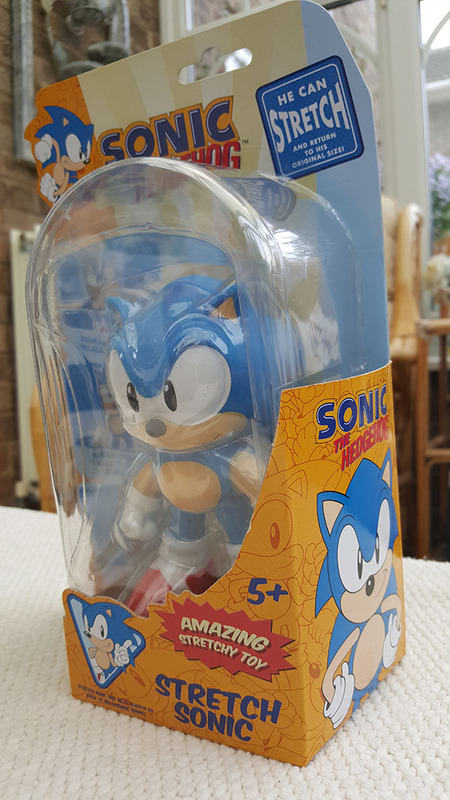 Without any announcement, shops in the UK suddenly have a Sonic stretch toy. I’ve never fully understood why these toys are so popular, it just seems strange to me, what do you actually do with one of these? You pull his arms and legs and well… that’s about it, they can’t stand on their own, you can’t really play with them using other action figures, it’s just it’s own thing which has a party trick. But it looked really nice in the box, so I brought him home and decided to have a play with it for a while. The initial presentation is really nice, whilst it’s using the old style guide, it’s finally dropped that awful ‘collectors edition’ logo which they used to put on £5 pants from Primak and everything else. 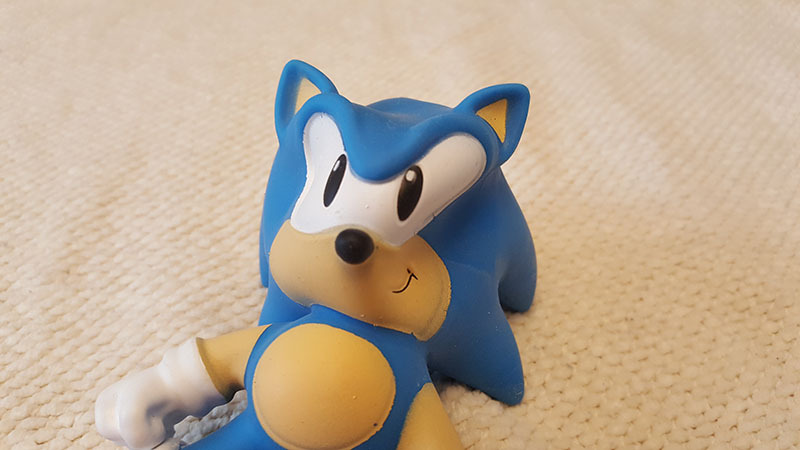 Otherwise, it’s the usual things, stock art of Sonic, images of happy children trying to rip his limbs off, everything you’d expect from a toy like this. But there is one huge flaw with the packaging that’s going to make some collectors out there ask the question ‘should I get two?’ Basically, you have to destroy the packaging to get at the toy. It’s quite misleading as the cardboard at the bottom of the packaging appears to open up so the toy can slide out, but it doesn’t so you have to destroy the box to get the figure out. So I made the decision to destroy the packaging and get at my Stretch Sonic figure. If you have never owned a Stretch Armstrong figure before, the figure feels strange. It’s a bit like a slimy stress ball. As you touch and hold it, you can feel it slowly changing shape in your hand, it’s a very strange experience. The design of the figure is really good! They’re really tried to capture every detail, from his eyes to the buckle on the shoes, nothing is missing. There are however a lot of paint errors, but since the material is a form of rubber, there is no way it will ever be flawless, it will be virtually impossible to find one that is. Stretch Sonic also feels very durable, you can throw it around and give it a lot of abuse and it’ll remain intact. It also does exactly what it promises on the box, it returns to it’s original shape, in fact it does it so quickly I wasn’t able to capture any good photos of the figure after I’d mutilated it, it just returns to it’s original form too quickly. In terms of how well you can stretch the figure, Sonic has a few extra tricks compared to a standard Stretch Armstrong. Whilst you can stretch his arms and legs, you can also stretch his individual spikes! This was a really nice surprise when I tried it, you can make him look like all the bad early 3D Sonic renders from the late 90’s if you try! The only problem I have with the ability to stretch him is that, the manual states his limbs can stretch up-to 40cm… but I was too afraid to stretch him beyond 10cm. I just couldn’t see how it could possibly go any further without snapping. It felt like it was at the absolute limit which doe limit the fun. Another problem is that, you really need a second person to get the most fun out of this, it’s just too hard to stretch multiple limbs on your own. The figure is quite awesome, I was surprised at how much fun I had when I started to play with it. 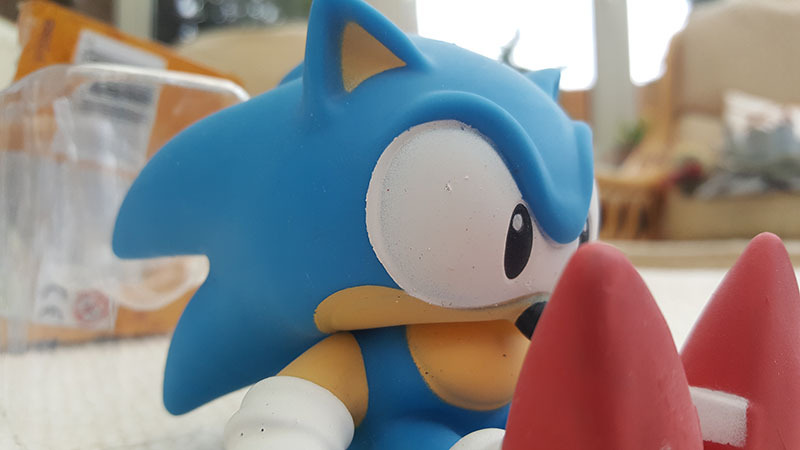 There is something humorously curious about seeing how many different expressions you can give Sonic by pulling and stretching his face. He can’t stand on his own accord, but he looks really nice if you sit him down and prop him up. He’s also a large chunky figure so he really will stand out even on a crowded shelf of merchandise. The only big downside is that you have to destroy the box to get the figure out. 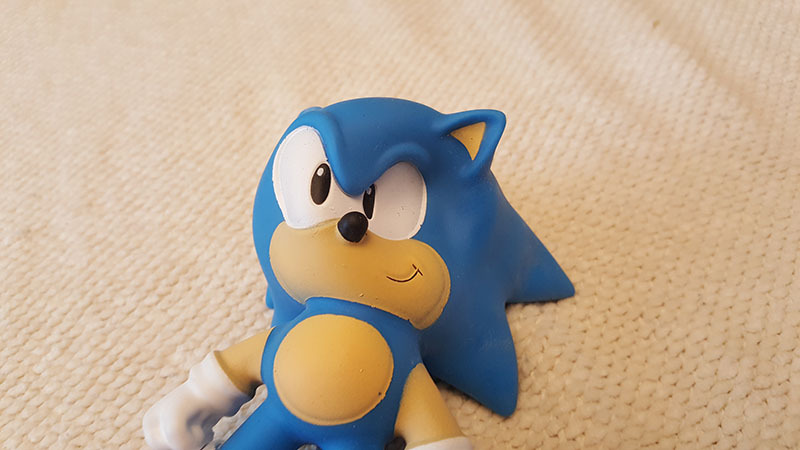 Kids will love it because there is a lot of fun to be had at trying to stretch and torture Sonic, adults will probably enjoy it because it’s a great stress ball toy. If you’d like to see what it looks like to stretch, check out the video below at time index 8:55. Product was purchased by the author. Next Post > Next post: You Can Soon Eat Sonic The Hedgehog Curry!